UNDER ISLAMIC FINANCE, YOU HAVE TO PAY FULL SELLING PRICE NO MATTER WHAT. 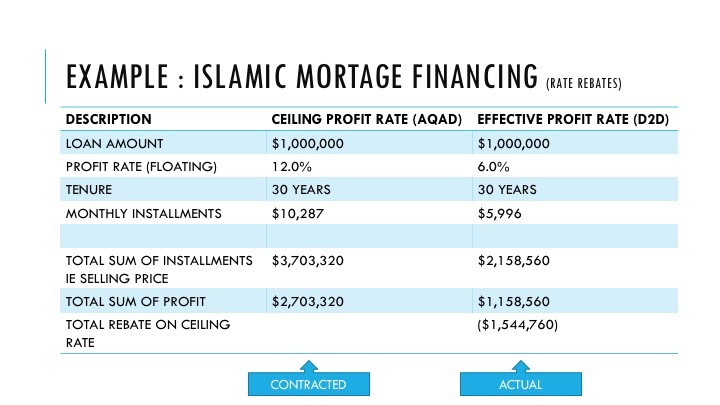 One of the misconceptions that plague the Islamic Banking financing in Malaysia is that once the Customer agrees on a price in an Aqad (Offer and Acceptance of Sale & its Terms), there is no backing out of the Selling Price and other considerations. If a house at current Value of RM400,000 (Principal) is purchased from a Bank at a Selling Price of RM1,000,000 to be paid in instalments over 35 years. This means the profit earned by the Bank over 35 years is RM600,000. The misconception is that when the Customer intend to Sell-Off or Pay-Off the financing in let’s say Year 8 of 35, the whole amount of RM1,000,000 must be paid to the Bank due to the concluded Aqad, where RM1,000,000 is contracted. So, if at year 8 the Customer has paid a total instalment of RM110,000, the remaining RM890,000 is still payable by the Customer. Whereby the Principal Outstanding for the Financing is RM320,000 in this scenario. For a Conventional Loan, the amount payable is the Principal Outstanding of RM320,000 + any interest outstanding (earned but not yet paid) + any early settlement penalties. SETTLEMENT OF THE SELLING PRICE. Because of this misconception, a lot of Customers think that a Shariah-compliant financing is More Expensive than the Conventional Loan. This is just a half-truth. 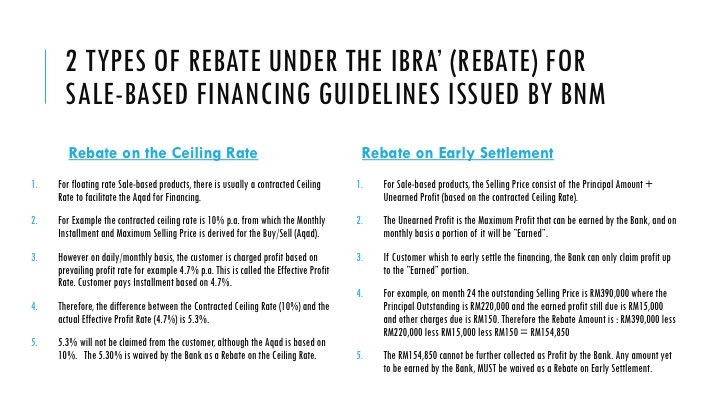 While the Selling Price Outstanding is RM890,000 as contracted in the Aqad, Islamic Banks are required to provide “Rebates” (Ibra’) on the Selling Price Outstanding to be fairer to the customer. Although entitled to earn the full amount of Selling Price from the Aqad, a Rebate on the Selling Price should always be given. Traditionally and by nature, Rebates are discretionary on the financier, to be given to the Customer as the Aqad allow for the collection of the full contracted Selling Price. To achieve parity with the Conventional Loans, Islamic Banks have opted to give rebates on the Selling Price, based on their discretionary calculations. This may include early settlement penalties or other charges, which improves the Bank’s profit ratio. This has resulted in inconsistencies to the amount of rebate given; one Bank may charge differently to another. Rebate arising from differences between the contracted Ceiling Profit Rate (CPR) and the Effective Profit Rate (EPR). Rebate arising from the waiver of Unearned Profit due to Early Settlement of Financing. This is applicable where the structure allows for pricing based on floating-rate, usually prevalent for long term structures such as a 30-year home financing. The structure allows for the customer to be charged based on a floating rate ie prevailing market rate which moves in tandem with the various base rate benchmarks. The benchmark can also be a conventional pricing rate that moves with the market. For example, the prevailing rate consists of a Base Rate of 4.05% + Margin of 1.45%, giving us an effective rate of 5.50% pa. Effective Profit Rate (EPR) : 5.50%. However, for the purpose of Aqad, all the terms must be agreed upon execution and perfection of Aqad. If the Rates are moving, how can all the rates be agreed upon up-front? Thus there is a need to agree on one Rate where Islamic Banks can conclude the Aqad with an agreed-upfront Selling Price. To conclude the Aqad by formalising the Selling Price, the following is required. The second element of misconception was what mentioned earlier. That to early settle you have to pay ALL the remaining balance of the contracted Selling Price. This proved to be a major contention by customers, although it is NOT TRUE in Malaysia. Mandatory Rebate must be given in the following early settlement scenario, and a penalty for early settlement cannot be imposed as it will be deemed as trying to earn additional profit on top of whatever profit is rightfully yours. Upon early settlement, the Unearned Income or Profit must be waived from being charged to the customer. A Bank can therefore claim profit that is rightfully theirs ie “earned”. Financing settlement where the customer cancels or terminates the financing before maturity date. 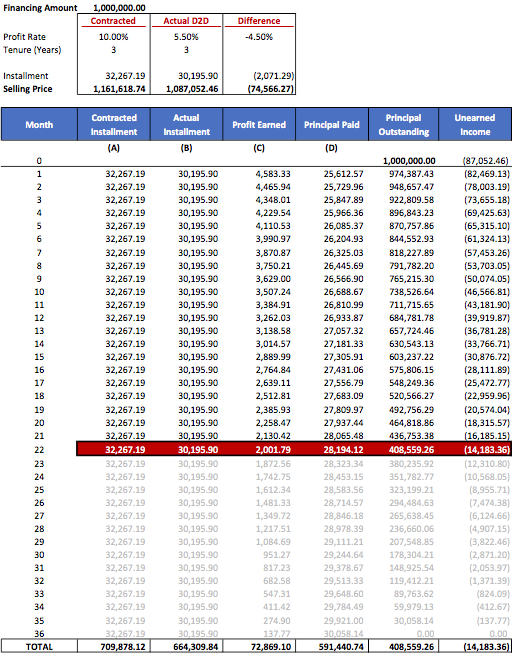 Early Settlement Amount is RM485,127.69 on Month 22 i.e Outstanding Selling Price (+RM497,308.90) less Unearned Profit Outstanding on Settlement Date (-RM14,183) plus Earned Profit Not Yet Paid on Early Settlement Date (+RM2,001.79). This amount is at par to what a Conventional Loan figure for Early Settlement would be. In fact, in some circumstances, a Conventional Loan figure may include additional Early Settlement Penalties that generally are not allowed under an Islamic Banking financing. Costs that has not been recovered arising from a discount element in a specific period in the financing. For example, the Bank offers a Home Financing rate of 1.88% p.a. for the first 2 years and BR+1% thereafter. The reasonable costs in this case is the differential between BR+1% less 1.88% ie the shortfall from the promotional period against normal board rates. Cost borne by the Bank during initial stages of the financing for example Legal Fees absorbed by the Bank. If the package offers a Zero-moving cost solution, it means the Bank pays the legal and stamping fees for the customer to move from the other Bank. The cost will be recovered by the Bank. Consequently, any reasonable costs incurred by the Bank as a direct result of the Early Settlement can be considered to be recovered by the Bank. The Shariah Committee of the Bank can take into consideration to approve the request to charge such fees, based on acceptable justification. This includes any “break funding costs” incurred by the Bank. The common perception is that for Islamic Banking products in Malaysia, the Selling Price (which includes future profits ie Unearned Income) must be paid to early-settle an Islamic Financing is inaccurate. Currently, there are provisions to waive the unearned profits from the final settlement amount as guided by BNM. In essence, the settlement amount should consist of only the Outstanding Principal Amount + any due amount or earned amount still outstanding on the settlement date. This means, the settlement amount for Islamic Financing is NOT more expensive than a conventional loan, and in some cases, is even cheaper than the conventional settlement amount. This entry was posted in Bank Negara Malaysia, Compensation Charge, Islamic Banking, Islamic financing and tagged ceiling rate, Early Settlement, Islamic financing more expensive, Rebate by Amir Alfatakh. Bookmark the permalink. I think for ease of understanding, I will revamp my calculation to a shorter tenure (from 30 years to 3 years) so that you can also see the full schedule and calculation. The earlier examples are just illustration, not actual simulations. Please check out the updated writing and calculations. I do feel that your calculation is right. However, since the alternative calculation is from BNM document, I’m confused. Could you kindly shed some light? Thanks for your comment. I think the BNM calculation and the calculation I used is similar ie consistent on how a mortgage calculation will look like in the Bank. 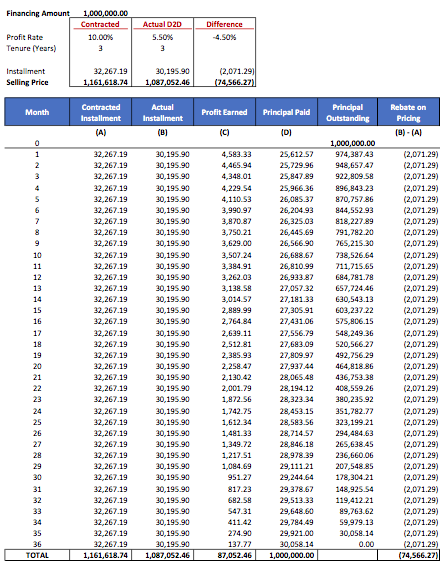 The main difference is the BNM illustration incorporates both elements of rebate into the same table. In my illustration, I have essentially split the calculation into 2 calculators where one shows rebate on ceiling rate, and the other shows rebate on the unearned profit in the event of early settlement. 1. The CPR is calculated based on the maximum Ceiling Rate, for the purpose of Aqad. So you have a Maximum Rate, Maximum Ceiling Rate, Maximum Unearned Profit and Maximum Selling Price concluded on Day 1. These numbers will be used as a control in our Bank system which we cannot exceed to collect. 2. On Day 1 (disbursement date) the Actual instalment is calculated based on EPR ie the prevailing rate. This is the amount fixed if the EPR do not move further. 3. On Day 30, when all the accruals are calculated and posted, The profit will be calculated based on the Principal Balance outstanding x EPR/12 months. This Profit is posted from the Unearned Profit to the Earned Profit bucket. 4. On Day 30 as well, when the Actual Earned Profit is calculated, the Principal paid is simply the formula of : Installment Amount based on EPR less Actual Earned Profit. The Principal Paid is deducted from the Outstanding Principal. 5. Further on Day 30, the Rebate on the pricing is calculated as a maths formula (balancing figure) i.e. the Maximum Profit Earned less the Actual Earned Profit = Rebate for the month. There is no separate formula to specifically calculate rebate on its own, but a difference between the two figures. 6. So on a monthly basis, the Profit earned is calculated based on EPR and Outstanding principal. Differences between the monthly contracted figures and the actual figures are rebates. 7. The situation is the same when the EPR moves. The rule is that when EPR moves up or down, the Actual Installment is recalculated to reflect the right split between profit and principal payment (to retain the expiry date). If Installment is not adjusted, the split between profit and principal is skewered which will result in accelerated or extended expiry date. Nonetheless, the Rebate calculation will always be the difference between the maximum and the actual charges. 8. Therefore, at the end of each expiry / calculation / termination / early settlement period, whatever amount that needs to be recovered and already earned must be collected by the Bank and settled. Anything above what has been earned (i.e. unearned amount) will be given as rebate. The end result will be at par with conventional calculations, except when the rate goes above the ceiling rate. The calculator that you are building must be consistent with the above understanding. Trust your understanding of the calculation and build the calculator. What I can infer is that BNM early settlement table’s deferred profit have not combined both rebates (it doesn’t calculate ibra due to ceiling rate) . Keeping this fact in mind, your website’s early settlement table’s formula to arrive at deferred profit shall correspond to BNM’s early settlement table’s formula to arrive at deferred profit. However, I discover that both formulas are not the same. Apologies for making your mind clutter… but I am sure you can figure it out. Could you just confirm my finding as per below? BNM early settlement table’s deferred profit have not combined both rebates (it doesn’t calculate ibra due to ceiling rate). The table only shows ibra calculation for early settlement. Yes agree. The table given by the guidelines has specific function ie as an illustration to customers at Day One to indicate what is their initial commitments, and help explain how the calculations are. After the Aqad is completed, the illustration remains a reference document, but actual calculation will be as per bank’s record. Salam En Amir. Great explanation but perhaps could be translated into Bahasa Melayu as well. Therefore, public people especially Malay Muslim could read this article and will clear up ‘misunderstanding’ about Islamic banking.